San Francisco Ballet devotees have a bit of a wait ahead of them - the 2014 season is still four months away and this year’s “Nutcracker” doesn’t open until December 11th. Fans are eagerly anticipating their favorite choreography performed by the beloved dancers of this world-class company. But equally, they are awaiting the sublime sounds of the San Francisco Ballet Orchestra. Thanks to Reference Recordings, Bay Area balletomanes can visit the ballet anytime they wish, even in the off-season. 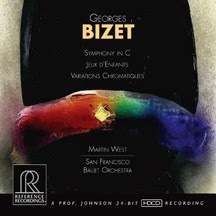 Their most recent release features three scores by Georges Bizet - Symphony in C, Jeux d’Enfants and Variations Chromatiques – brought to life by the incomparable San Francisco Ballet Orchestra, under the superb direction of Martin West. Composed in 1855, Bizet’s Symphony in C was the music chosen for George Balanchine’s 1947 ballet of the same name. Divided into four separate short movements, the score contains an impressive compositional variety, making it a perfect match for the neo-classical ballet genre. The allegro vivo has a strength and clarity; the scherzo, a majesty and grandeur; and the finale takes scalic runs at a super human speed. But, it is the second variation, the adagio movement, that takes one’s breath away. In it, Bizet offered melodies that are both gentle and haunting, and added a surprisingly delicate staccato motif mid-way through the movement. 1871’s Jeux d’Enfants (Opus 22) suite is appropriately whimsical, musically deep and just plain fun to listen to. Each of the twelve selections reflects a youthful flavor and espouses lovable characteristics. Two were particular stand-outs. At only one minute and twenty-seven seconds, the saute-mouton (orchestration by Roy Douglas) sounds exactly like the musical version of a leap frog game with its hopping, skipping and scurrying figures. And the finale, galop: le bal (orchestrated by Bizet) is a wonder to behold, complete with an expectant melody, a slight accelerando and a lively coda. The final offering in this new collection is the very rare Variations Chromatiques, composed by Bizet in 1868, and orchestrated by Felix Weingartner. In this fifteen minute piece, dynamics run the gamut from the slightest pianissimo to the most forceful sforzando. A gorgeous reed solo is introduced after the first few minutes, yet the highlight of the work is how the chromatic scale is peppered throughout. Introduced in both ascending and descending order, these half-step progressions provide a mysterious and wonderfully eerie anticipation.